The right hardscape elements will improve the appearance, value and function of your landscape. Custom designed and installed patios, retaining walls, walkways, pool decks, driveways, planters, and outdoor living areas are available from a wide selection of materials. 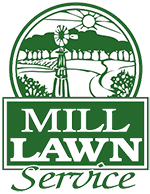 Mill Lawn Service uses a variety of materials like concrete pavers, natural and cultured stone to achieve the desired look from any creation. We are here to develop your ideas into plans or show you different possibilities and options to create the design you have in mind. All the aspects of the hardscape installation along with maintenance and repair will be taken care of by experienced and reliable staff members.